The Maasai Stoves & Solar Project of the ICSEE proudly announces a significant collaboration with the Global Fund for Widows (GFW). In 2018 the Fund asked the ICSEE to analyze the situation of Maasai widows, specifically. The polygamy of the Maasai, arranged marriages, and lack of educational opportunities due to early marriages all lead to the special vulnerability of women when a husband dies. We were thrilled to be asked to design a program based on this analysis, and our relationship with the women of the Maasai communities. Backed by GFW funding, ICSEE facilitated a new project, organizing 25 widows in each of three villages. All benefit from the leadership of the outstanding Cypress Hill Manager Mesha Singolyo, who is also an experienced leader of the district government’s community development. These groups have begun a process of working together for income. 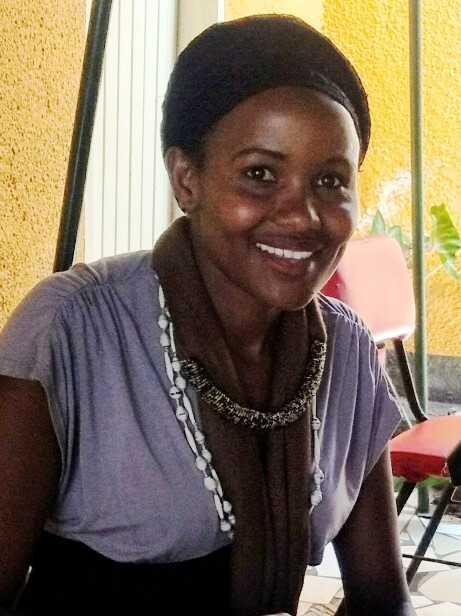 For a completely fresh start, Ms. Singolyo chose villages that had not yet participated in the Maasai Stoves & Solar program, including Nanja and Mtimoja villages. She also organized a group of widows from Longido town. She convened meetings with the leaders of each location. These are the elected chairman, the executive officer appointed by the government, and the leadership committee, comprised of village men and women, including some widows. Our collaboration with the GFW is exciting! In each village the 25 women are establishing their own VICOBA, or Village Cooperative Bank. They elected officers and received training for running their banks. These cooperative banks have become widespread in Tanzania. The owners/members each make a small regular deposit in the bank. Individual member then apply to the bank managing committee for loans. Applicants receive the loan by demonstrating a good purpose and viable plan for paying back their loan.The idea is to continually make the funds available to the other members through timely repayment. The widows, the GFW and the ICSEE agreed on a special arrangement for these VICOBAs to help the widows make a great start while generating income for all. A large portion of the grant from the GFW was deposited in the banks to augment the balance established by the deposits of the women. This allows for much larger business loans than could be based on the deposits of the women themselves. The first loan was to the entire group of 25 widows who are collectively beginning their new goat business. When well timed and well managed, goat businesses generate good profits in about six months. The widows will be able to pay back their collective loan and move on to more planning for group and individual use of their new resources. 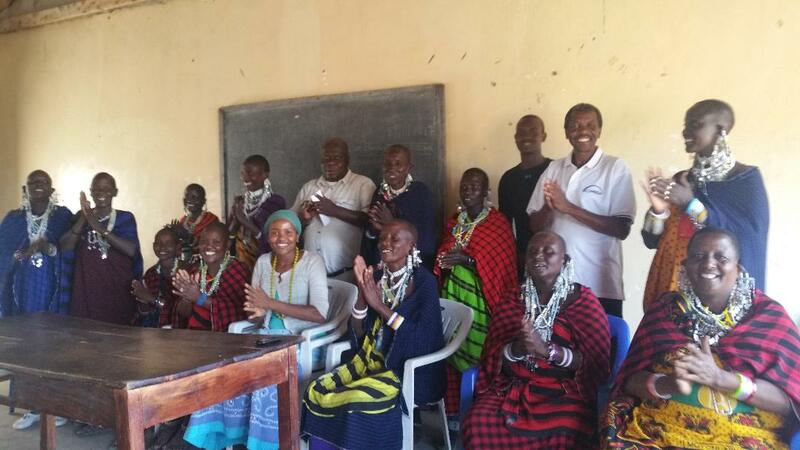 From the beginning, ICSEE’s work with the Maasai has been based on creating a broad collaboration with women. 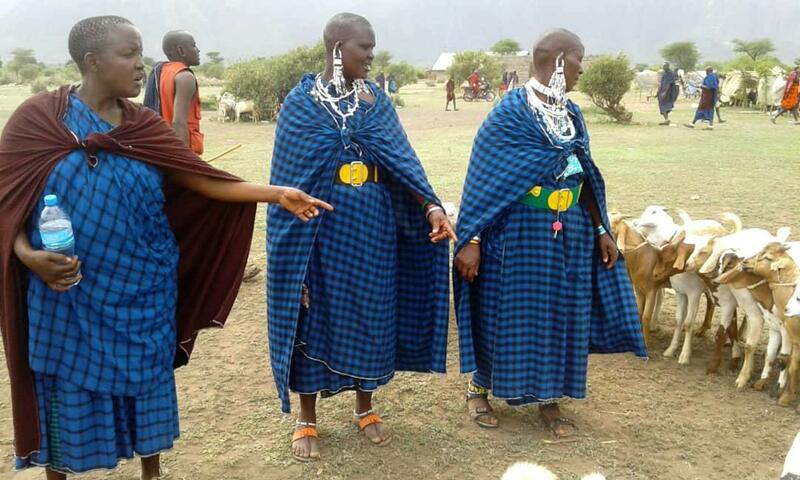 Maasai women are more constrained in their lives than men. For many of them, working with the Maasai Stoves & Solar’s installation team has opened up an entirely new path towards improving their lives. And for some, this is literal, as for the first time they have the chance to visit women more than a couple of walking hours away from their burdened lives at home. As organizers, the ICSEE began to appreciate that our greatest gift was giving Maasai women a chance to add a new dimension to their lives; the chance to work with others to make life better. Homes don’t have to be smoky. Night time doesn’t have to be dark. And women could be organized for enterprises benefiting them all. Of course, Maasai women are diverse, but the needs throughout are clear. They need more opportunity to get the social benefits of working together. And they need more ways to earn money. ICSEE is grateful for the Global Fund for Widows collaboration. It is remarkable when the goals, expertise, community relations, and resources come together so constructively. 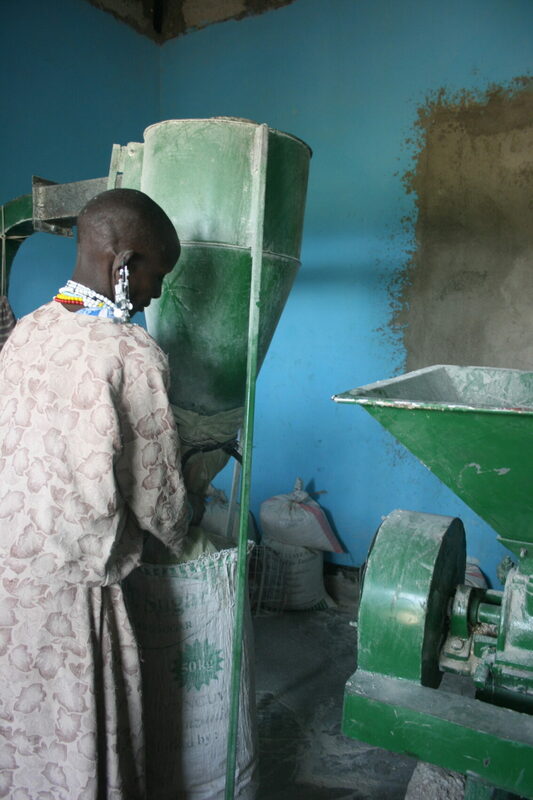 The Maasai Stoves & Solar Project operates cornflour mills. These are the only women-led mills in the region. They provide employment for Maasai women, especially widows, and were established originally with the help of CODEGAZ, a French NGO of volunteers from the GDF Suez Corporation. When a mill is located right at a market, as these are, customers can buy corn, join the queue, and have their corn ground into flour while they wait. And if the women have the time, the mill queue becomes a warm and friendly social setting, as well. The first Maasai Stoves & Solar mill was located at the big market outside Mto wa Mbu in the Rift Valley. The women of the Monduli Pastoralists Women’s Organization (MPWO) recently moved the mill to the center of Selela village. They believe it will become more profitable there. The second mill, located at the market in Monduli Juu is doing really well. After costs and salaries are met each week, there is a good profit, fed back into the betterment of the lives of Maasai women.